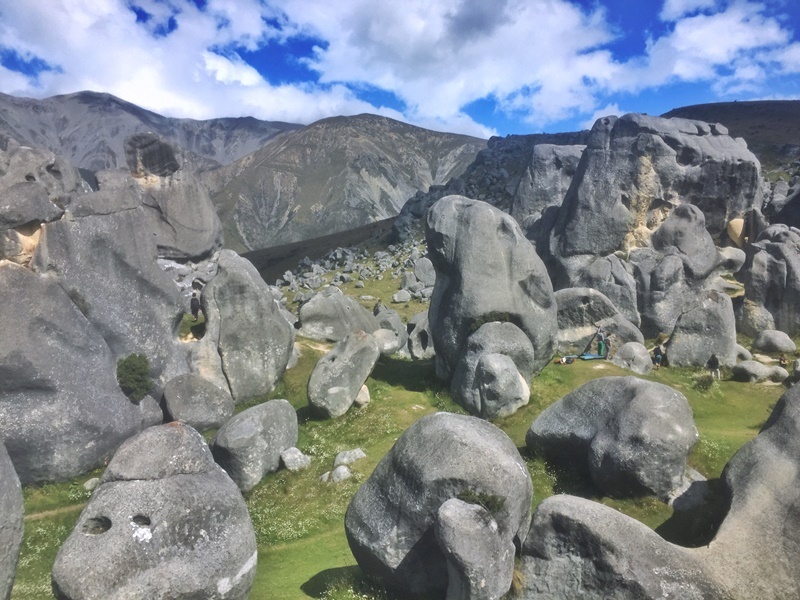 This post is about taking a DIY day trip to Castle Hill from Christchurch. After reading this post, you’ll know of three great budget-friendly (free) activities for an awesome day in Castle Hill (this was one of my favourite day trips). At the bottom of the post, I’ve added some information that may or may not be of use. The foggy Peak summit! Token prayer flags. We completed this Castle Hill day trip on the 11th of January, so while school holidays are still in play, a lot of people are back at work so the madness of the holiday period has subsided. My buddies Nina & Garrett have recently bought a van, so that was our transport for the day. They’ll be spending a good amount of time in the country, so for more NZ content Nina will be posting lots on her blog and Garrett will be posting a New Zealand vlog each week. This does not appear to be a popular hike, as we only saw one other person in the four hours we spent on the trail. That doesn’t mean it isn’t worth it. Personally, I really enjoyed the walk and would love to do it again on a clear blue sky day. The parking area isn’t well marked, but it’s here on Google Maps; it’s more of a layby at the peak of Porters Pass on SH73. You can see the trail marked on Maps.me. The hike (out and back) up to Foggy Peak is relentless with no flat sections as soon as you leave the carpark. The trail is marked with poles to start, but these disappear after ~10 minutes with cairns leading you in the right direction. There is a reasonably obvious path you can see on the way up, though you might find yourself veering off from time to time for convenience. You’re above tree level the entire way, therefore you won’t get lost (unless the fog really rolls in and you get disorientated). It doesn’t take long until you start getting epic views. As your walking up the hill, you’ll see Lake Lyndon over your left shoulder, and on a clear day, you’ll see Mount Cook too. To the left, you’ll see the mountains ranges, that run along the west side of the South Island. To your right, you’ll see the flat plains extending back towards Christchurch. According to Maps.me the hike from the layby to Foggy Peak is ~2.5km with 1km of elevation (that gives you an idea of how steep the trail is). 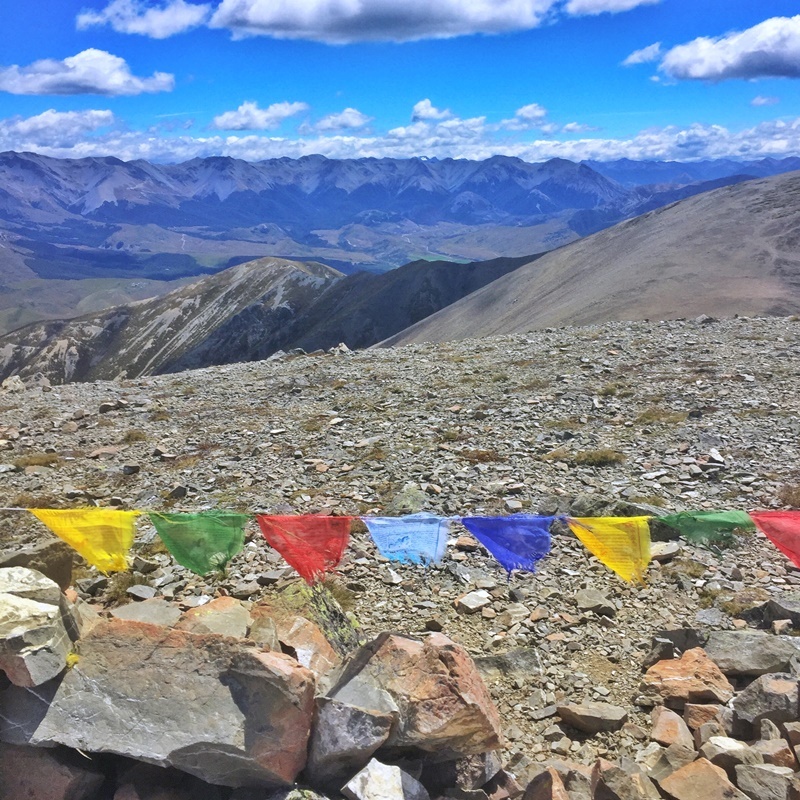 There is one false peak on the way, but you’ll know when you’re at the peak with the larger cairn and prayer flags waving away. We took a bit under two hours to reach Foggy Peak, though fast walkers who aren’t stopping for photos and videos could complete the walk in an hour. 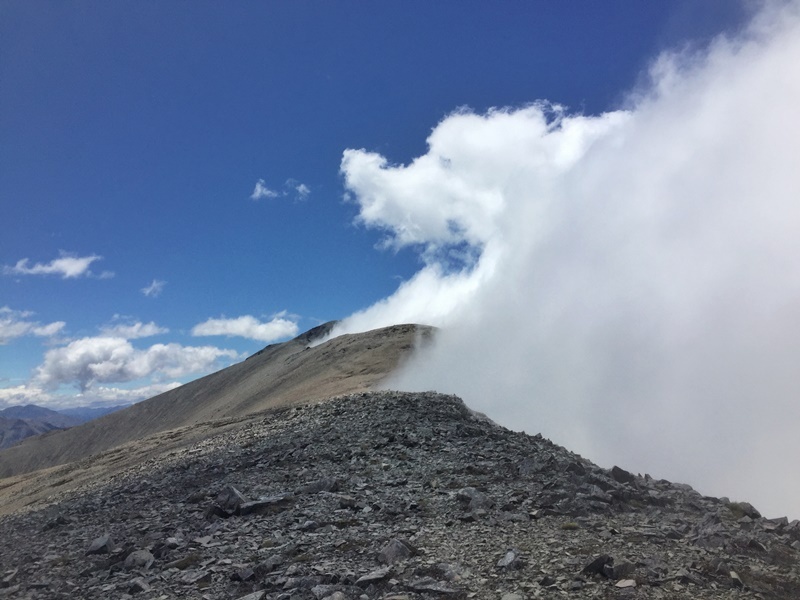 From the Foggy Peak Summit, you’ll hopefully have 360-degree panoramic views, or you might find the fog has rolled in as it did for us meaning you can’t see everything. When you’re coming down, be prepared to slide your way down the dirt and rocks. Given how steep the walk on the way up was, it wasn’t as bad as we expected coming down which is obviously a lot faster than going up. There’s no shelter on the trail at all, so be prepared appropriately depending on the weather. 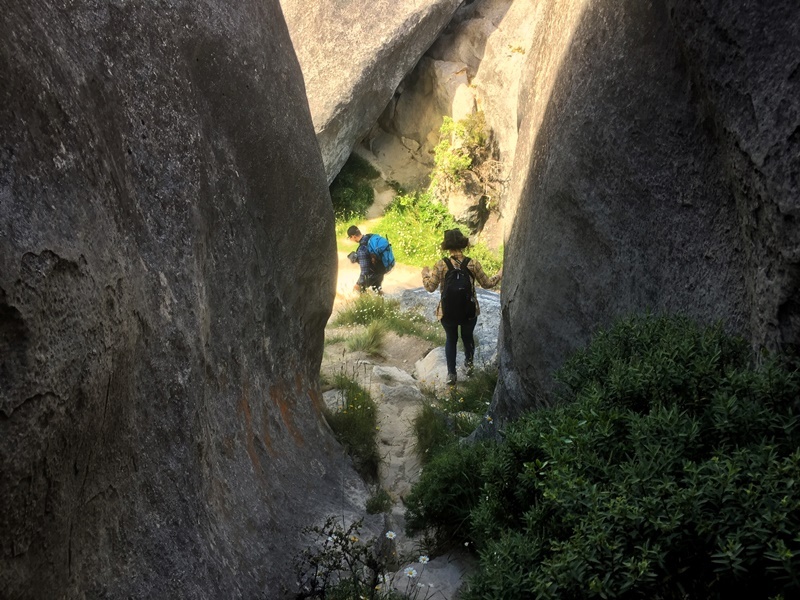 You can continue walking another 3-4 km (each way) to Castle Hill Peak from the top of Foggy Peak if you like. The trail simple continues down the other side of the Foggy Peak summit. We began walking to Castle Hill Peak but decided we needed to turn back to make sure we had time for the other activities with rain scheduled later in the afternoon. as mentioned, if the fog rolls in on your walk, your visibility plummets in seconds. If you’re not an experienced hiker, I’d advise bringing a compass/GPS of some form. It’s a straightforward walk in terms of an in and out walk, but you never know. the carpark is right by the highway, and while us Kiwis are trustworthy, it’s a good idea to take your valuables with you. So many cool shapes and stuff! Thanks nature. Kura Tawhiti is 10.2km from the Foggy Peak carpark. This is the most popular attraction in Castle Hill. Yes, they are rocks. But they’re cool! Promise. Having only seen one human on the Foggy Peak hike, it was pleasing to see two dozen vehicles in the Kura Tawhiti carpark (something I never thought I’d say). Beforehand, I knew you could do some bouldering here, but that was about it. My expectations were low. There are trails leading all over the place (you won’t get lost). From the carpark, you follow a path for ~600 metres before you get to the main area. As we were walking down the path I thought the rocks did look cool but didn’t know how fun it’d be given I have no bouldering skills. My fears were quickly alleviating when walking through well-trodden paths winding through the rocks, labyrinth style. The colour, shape, size, and positioning of the rocks make for fascinating viewing, as well as a photography dream. Despite no bouldering experience, I found plenty of places where I could get up on the rocks and have some fun. At some points, you’ll find yourself 3+ meters above ground, so there are some risks involved if you do decide to run around/climbing on top of the rocks getting that cool selfie. You could spend an entire afternoon here hanging out, but for most 30 minutes to 1 hour is going to be plenty. 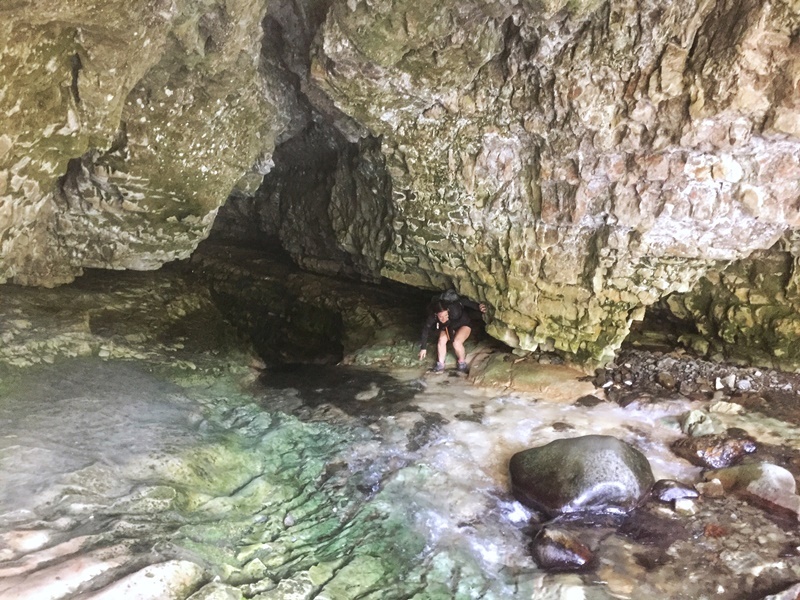 Nina exiting the cave after 40 minutes of adventure. The Cave Stream Scenic Reserve is 6.5km from Kura Tawhiti. I’d only heard of this cave the day before, and our brief research we didn’t give us too many clues on what to expect. When you arrive at the carpark, there’s a small toilet block and a couple of signs providing information on the area. This reserve is more popular than the Foggy Peak track but less popular than the cave rocks. For non-cavers: There’s a loop track you can do, which takes you past the cave exit. Take either the left or middle track to complete the loop. It’s also worth a visit to the cave entrance where you can enter the first section of the cave without getting wet. Looking back at from inside the cave entrance. Caver’s: The sign at the entrance was confusing, but the cave entrance is accessed via the path leading to the right. It’s no more than a 10-minute walk to the cave entrance (follow the signs). The mouth of the cave entrance is rather photogenic (see above), and if you aren’t planning on walking through the cave, you can enter the first 10 metres or so without getting wet. Even though it might be a nice day, I’d nominate one person to walk through the first 40 metres of the cave as a test as this is the deepest section. Specifically, the deepest section is just after you make the first right-hand turn in the cave. I’m ~172cm tall and the water level was just below my chest. Once you navigate this section, you’ll be waist deep at most (mostly knee depth or lower). But, the higher the water level, the faster the current is going to be. Make your own judgment about proceeding with the cave walk and read other reviews on TripAdvisor etc (a.k.a. don’t hold me accountable 🙂 ). The cave is reasonably narrow, and you’ll be walking through water the whole way. You’ll need some form of light, and this is most useful for looking at where you’re standing. The water is clear (if it’s not, it’s likely to dangerous to walk through safely) and the limestone (white) rocks are very grippy and are the best to stand on throughout the walk. If you’ve ever seen Antelope Canyon, this is like the underwater version of the canyon with the same kind of style rock shape (no idea on the colour!). There are lots of bends, but there is only one route from end-to-end so you won’t (shouldn’t) get lost. Most of the mini ‘waterfalls’ (1-metre high type things) are easily navigated, but there was one in particular about halfway through that was tough to climb up. Take your time and you will get up, though it may take a couple of efforts to get a feel for how the water flow effects you once you step up. The other tough section is right at the end when you’re exiting up a 3-meter ladder and then needing to squeeze under a rock. This is at the very end, and you’re above the water level when you’re climbing the ladder and squeezing under the rock, therefore as long as you take your time it’s fine. And you can actually see now too! I’ve seen the length of the cave mentioned as short as 250 metres, and some say it is 500 metres long. I couldn’t tell you what it is, but it took us 40 minutes to go through at a slow and steady pace. What did I wear? I went through with shorts, tshirt, sandals, and my phone. I wouldn’t recommend this and locals were pretty adamant I was underequipped. If the water was any deeper, I would have not gone. That said, I’m glad Nina was there (with shoes, shorts, t-shirt, small backpack with phone, and a light. The waterfall mentioned above would have been a struggle for me to get up on my own without getting my phone wet (I passed it up to Nina). You really do need two hands to get up due to the power of the water. Once you’re in the cave, you’re in the pitch black. YOU NEED SOME FORM OF LIGHT. The current is going against you, and in two sections you’ll need to have some strength to get to the next point. If you’re bringing a bag/phone with you, prepare for it to get wet. Definitely Summer (for this day trip)! Not that I’ve visited Castle Hill in winter, but it is a logical decision. 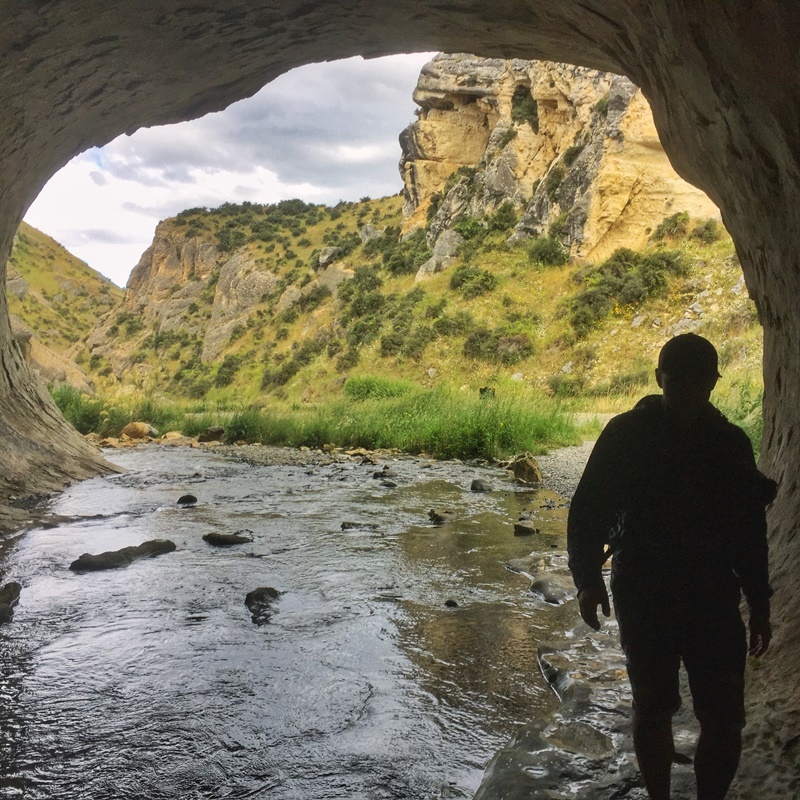 The snowy capped mountains look gorgeous in winter but when it comes to caving, the water level is likely to be higher (as the snow melts) and colder, therefore, increasing risk. At times throughout the winter, the trail to Foggy Peak will be covered in snow. It was slippery enough without any snow ! Car: The best way to complete this day trip. Once you get out of the city centre, you simply head through Riccarton until you reach the turnoff for SH 73 (clearly marked). From here, you stay on the road until you reach your first stop. The next two destinations are 10 and 16 km from the Foggy Peak carpark. Hitchhiking: it would be reasonably easy to hitchhike and complete this Castle Hill day trip. I’ve hitchhiked from Christchurch to Arthur’s Pass previously and didn’t wait long for any ride (it took multiple rides). It also helps these Castle Hill day trip attractions all start from the highway. You can read about some of the people I hitched with in New Zealand here. 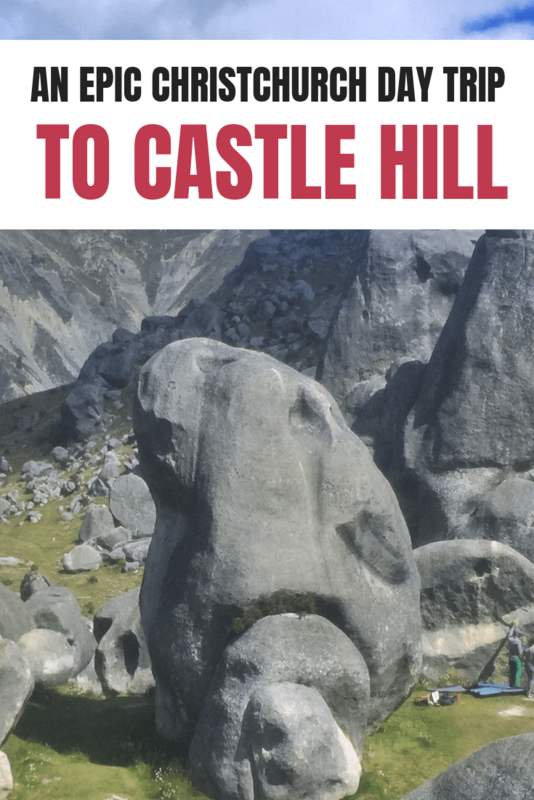 Bus: It’s possible to get to and from Christchurch to Castle Hill via bus, but it’ll cost $40 each way on AtomicTravel which means you’ll still need to hitch between places (you could walk, but I wouldn’t recommend doing so). Given the timetable, you’d have to limit yourself to the rocks and cave. Leave before 9 am at the latest (earlier in the winter). I thought we’d finish everything mid-late afternoon…it was more like 7 pm by the time we left the cave (we left Christchurch ~9 am). Wear sunscreen. The hike and rocks leave little respite from the sun and I came home looking like a lobster. Fail. Bring your own food & drink. There are no places to buy food at any of the attractions, nor in the small village of Castle Hill. Bring your own food to snack. If you’re going to have a picnic, I’d choose to do it at the rocks. Tell people your plans. You won’t be getting any wifi in these places, and while reception is found in most places, it is a good idea too let people know your plan anyway. I’d never heard of Castle Hill until I was driving past the area on the way to Arthurs Pass (hitchhiking) a few months earlier. This was an awesome day trip. Two days earlier, we went to Akaroa and while that was nice. This was way better imo. 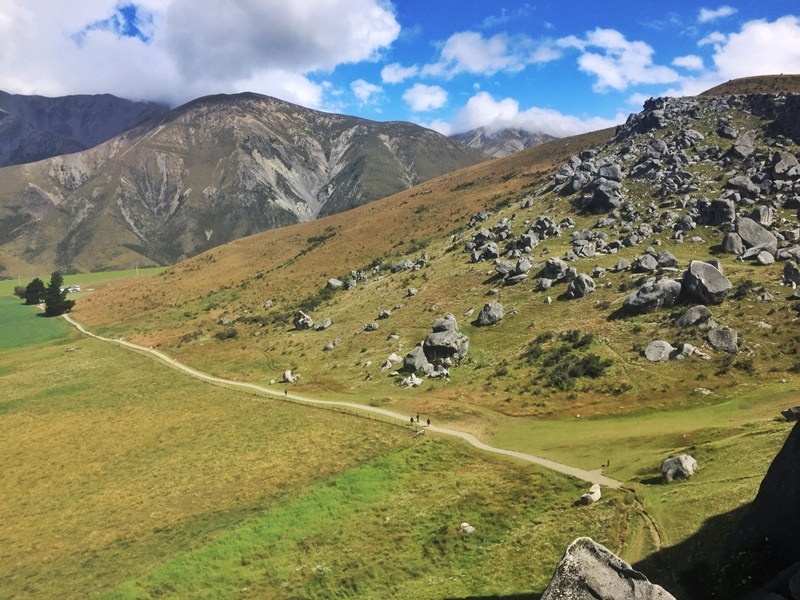 While you could spend a night in Castle Hill, there’s limited accommodation (you can see Booking.com options here) so I’d recommend continuing on to Arthurs Pass or head back towards Christchurch direction.